Audible.com has updated its app to allow customers to buy audio books directly from their iPhones and other mobile devices. More than 85,000 books will be available through the new Audible.com mobile store, which launched last week. Previous versions of the app allowed users to download their audiobooks, play them, and even earn “merit badges” for devoted listening. However, users were forced to use their computers to buy new books—until the new Audible 1.3 update. The inability to purchase new titles was a curious omission, since Audible.com is owned by Amazon; Amazon’s Kindle app has long made it easy to jump to the company’s mobile site, browse, and buy new books entirely using an iPhone. Other features of the app include bookmarking, advanced navigation tools that allow chapter skipping and fast-forwarding, and social media options to share book information via Twitter and Facebook. 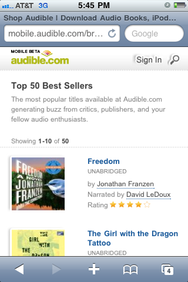 The Audible.com app is free, and runs on all iPhones, iPods and iPads running iOS 3.1 or later.